This solution might help you to fix Samsung GT-E2530 with “Insert SIM card error” problem. If the phone doesn’t recognize any SIM card inserted to it this might be your guide on how to solved and mend the issue. First thing you need to do is make sure that just dust or rust is not causing this issue clean the Samsung GT-E2530 SIM card connector and check if all the legs are in good shape, if there is any kind of damage to the SIM Card connector replace it with a new one. Check connection between all Pin of SIM socket contacts and Capacitor (at the board near SIM Control). If there is no continuity between capacitor and pin then it shows “Insert SIM” error message. 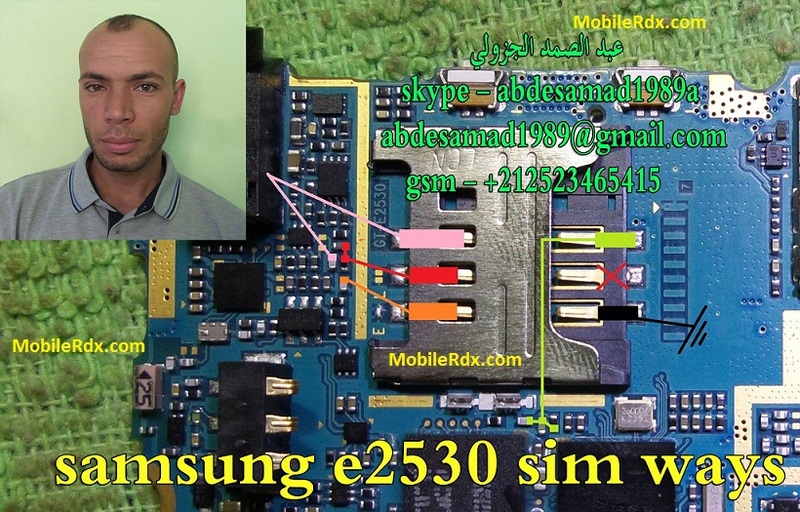 The picture above is how to fix the Samsung E2530 insert sim card. if your Sony is broken at the connector sim then you may try a jumper tricks like the picture above. The first step you need to check the lines as shown. The second step you are trying to replace a component six-legged. I hope this trick can help you. do not hesitate to try. Samsung E2530 Sim IC Solution Jumper Problem Ways Sim Not Working Sim Not Valid.